If you are believing the rumors that laminate is outdated as a flooring material, you are definitely far from the truth. In fact, talk to any flooring material manufacturer and chances are that if they are not biased, they will be telling you that despite the introduction of new flooring materials such as LVT and WPC, laminate flooring has extremely strong staying power and is still considered a favorite with many homeowners and business property owners. While the new flooring materials certainly have their own benefits, in order to see the real value of laminate flooring, flooring material manufacturers are reminding consumers to assess the different flooring materials wholesomely. On one hand, we have laminate flooring which has existed for more than 20 years now and on the other hand, we have the new kids in the block – LVT and WPC. The latter flooring materials are considered as trending products in the market. So, why are people thinking that laminate is still very relevant today and despite the competition, it is still going strong? In order to understand this, you will need to look at both the pros and cons of the different flooring materials. One thing all these flooring materials have in common is the fact that they are water resistant. This is a very important attribute for homeowners who are looking for durable flooring solutions. They are mostly installed in the kitchen and bathrooms. In fact, WPC and LVT dealers have been facing some challenges when it comes to marketing these products. WPC especially is a bit challenging to sell because most customers don’t understand the product well. On the other hand, retailers also have a hard time illustrating the benefits of WPC which limits its potential in the market. Why do consumers still prefer laminate materials over WPC and LVT? Laminate materials are easy to install and they take a short time to do it. What’s more, it is very easy to find professionals who specialize in laminate flooring in Toronto to get the job done perfectly. However, in order to get the perfect finish, you have to make sure that you buy the right quality of laminate flooring materials. 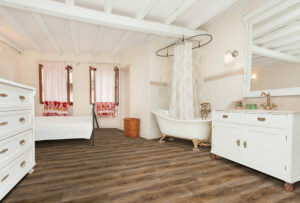 Laminate flooring is more affordable compared to newer flooring materials like WPC and LVT. The laminate floor materials are made of renewable materials which lowers the cost of production. Manufacturers in turn sell the materials at a cheaper price benefiting consumers. WPC and LVT flooring materials on the other hand are manufactured using synthetic materials which raises the production cost. The fact that laminate flooring materials are scratch resistant makes them a favorite among many homeowners. A homeowner does not have to worry about his or her floor getting scratch marks when moving furniture around. You cannot guarantee the same with other flooring materials. Flooring repairs are costly and every homeowner hopes to avoid such costs in the long run. Laminate flooring adds value to a home. For homeowners looking to sell their homes in future, they prefer investing in laminate flooring to add value to their property. The fact that laminate flooring is durable, it means that a homeowner can use his or her property for years and when it comes to selling the property, the value will still be up. All materials are water resistant as mentioned before, though WPC has an added advantage of being waterproof. There is a huge difference between a flooring material being waterproof and water resistant. However, WPC has one limitation. Homeowners prefer installing WPC in bathrooms rather than other rooms in the house and this limits the uses of WPC. On the other hand, laminate floors can be installed in all the rooms in a house which makes it cost effective. Laminate floors do not stain easily. A homeowner does not have to stress over spillages. It is easy to clean unlike other flooring materials. WPC and LVT require special washing liquids in order to clean the stubborn stains out. According to interviews conducted with key stakeholders in the industry, both flooring manufacturers and retailers agreed that despite the strong competition, laminate flooring is still very popular with most consumers. It is safe to say that the advantages of laminate floors still outweigh the advantages of WPC and LVT, and the applications of laminate flooring materials are more diversified than that of the newcomers.